The Akai APC Mini brings the legendary APC controller series back to life with a new sleek, re-designed chassis for added portability. Aimed.. The Akai APC Mini brings the legendary APC controller series back to life with a new sleek, re-designed chassis for added portability. 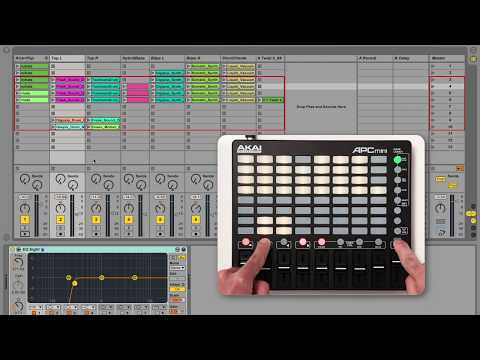 Aimed at the mobile producer and DJ on tour, the Akai APC Mini features an 8x8 LED clip button matrix for triggering audio clips and samples within Ableton Live, but can be re-mapped or modded for use with any plug-in or virtual drum machine for making beats on the fly. 8 assignable upfaders and 1 Master Fader give Akai APC Mini complete control over your virtual mixer, making it the perfect choice for DJs who want to be really creative and throw in multiple layers in the mix. Plug and play compatibility ensures you can power it via USB and make music straight out the box with minimum hassle and set-up required.